This innovative, affordable product couples leak detection and facility monitoring in one plug-and-play package. 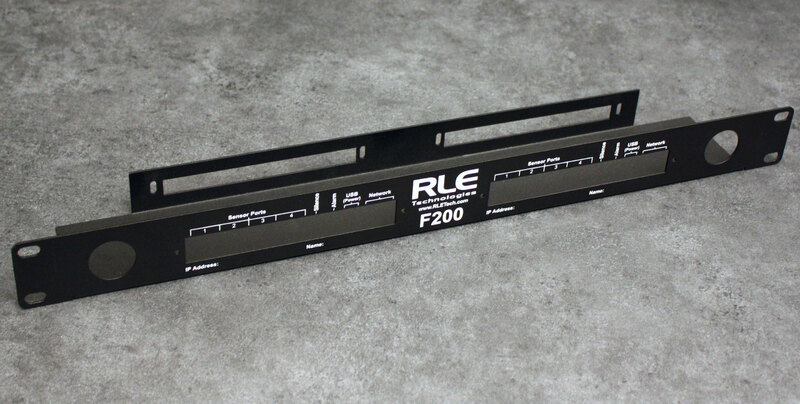 Designed to be simple, effective, and efficient, RLE Technologies’ F200 monitors environmental parameters and protects facilities from disastrous consequences. What Does The F200 Include? 4 Sensor Inputs – You choose whether you’d like to deploy temperature sensors, temperature/humidity sensors, or a combination of the two. 8 Digital Inputs – Unlimited monitoring possibilities. Monitor something as simple as whether a door is opened or closed, or monitor more complex parameters including motion sensors, fire alarms, gas detectors, airflow sensors, and summary alarms from critical equipment including UPSs and generators. 1 Relay Output – Use the F200’s relay output to control an external device in the event of an alarm condition. 1 Zone Leak Detection – The F200 can supervise an SD‑Z1 spot detector or up to 200 feet of our patented leak detection sensing cable and inline SD‑Z spot detectors. Timekeeping – Use the onboard configurable real-time clock (RTC) or Network Time Protocol (NTP) to keep time on the F200. Internet access is required for NTP. Logging – The dashboard displays the 50 most recent alarm and return to normal events, including date and time stamps for each. Trending – A line graph displays up to 86,400 points in time – each point records the temperature and humidity (where applicable) readings of all sensors plugged into the F200. Trending is customizable – you choose how frequently the points are sampled. View the graph through your web browser and use the sliders at the bottom of the graph to get an up-close view of your data points. Plug-and-Play – Once all your monitoring connections are snapped into place, the F200 does the rest. Information is displayed on the F200’s sleek, integrated web interface. Intuitive options and menuing keep configuration quick and easy, and the interface can be accessed from any computer or mobile device. Relay Output: 1 Form C summary relay; 2A @ 30VDC, 0.5A @ 125VAC. Configurable as summary alarm output or manual operation. 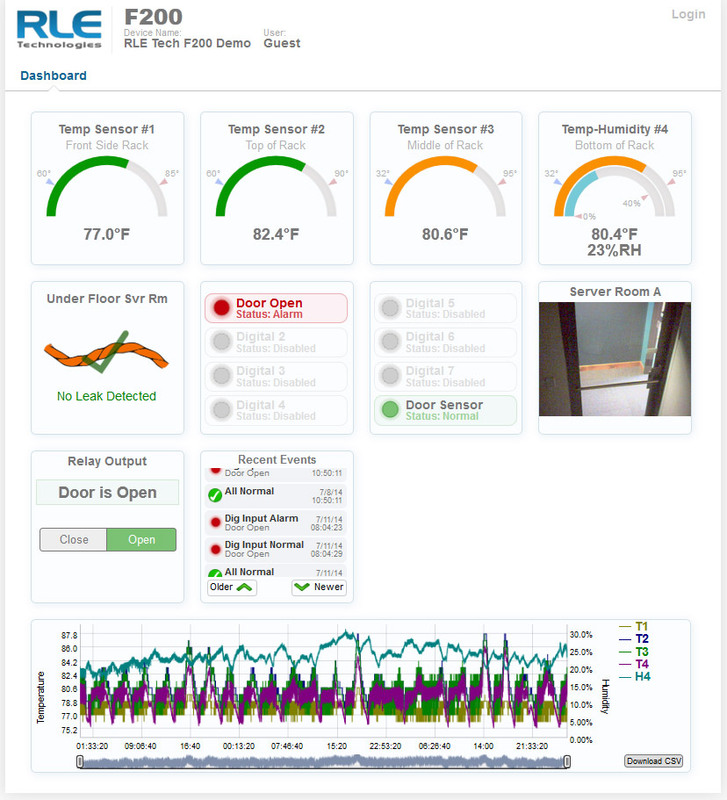 Trending: Records up to 86,400 points of sensor data. Sample interval set from 10 seconds to 1 day. CSV downloadable. Startup Guide – Firmware versions 4100 and above. – F200 Use this guide first. It helps you power up and connect the F200 to your network. Configuration Guide – Firmware versions 4100 and above. – F200 Designed to be used after the Startup Guide has been completed, this provides more in depth unit configuration information. Descriptions and tips are embedded into the F200 web interface. Mouse over the question mark icons next to the fields in the web interface to learn more about what each option does, and how to configure the fields to best suit your application. If you’d like to monitor the F200 as an egg in an FMS nest, both the FMS and the F200 must be running appropriate firmware. The FMS must be running firmware version 8.8.12 or newer, and the F200 must be running firmware version 3023, build 1420 or newer.